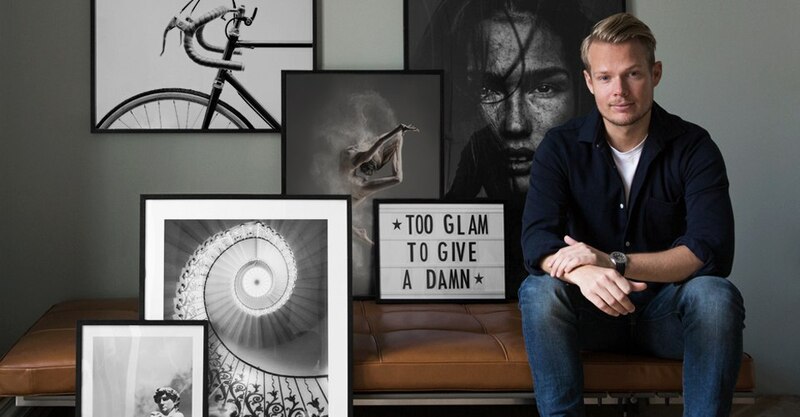 Jesper Laursen is the person behind one of Stockholm's most respected home staging companies, Scandinavian Homes. Working together with Jesper, Desenio has created a unique photo art collection comprising six different designs. The keystones in the collection were stylish, graphic prints able to work equally well in a collage or on their own. To the public at large, Jesper is perhaps best known through Instagram, where his interior design account Scandinavian homes (named after his company), currently has around 475,000 followers. Through social media he has created his own marketplace, and Scandinavian Homes is by far the largest of its kind. When asked where he believes the success stems from, he mentions two factors: the concept and the timing. ”When I founded Scandinavian Homes I was relatively alone in my niche, but a lot has happened in just a few short years. I honestly believe in focusing steadfastly on a style and ensuring consistency, that way you can develop a recognition factor. The Scandinavian design style is also huge abroad, and my followers hail from all across the globe." What was your first reaction when Desenio contacted you to propose a collaboration? When Desenio contacted me about a collaboration, my natural response was to say yes. Since we work in the same industry and appeal to the same target group, I knew instantly that we would create something positive together. Tell us a little about the collection. The common thread is photo art. I love the expressiveness of photography and I'm always on the lookout for tasteful posters to use in my styling. Now I can use my own, instead! The idea is for all six posters to work equally well as part of a gallery wall or individually, and in this I think we have succeeded! In interior design, how important is it to have something on the walls? It's very important! Posters and gallery walls have the ability to invigorate the whole interior. It is often the final ten percent that creates the whole and adds a personal touch to homes. How does one create the perfect gallery wall? I usually begin with a 'masterpiece' and build around it. And it's good if the designs have something in common – a recurrent colour, a certain size or style. Trusting your instincts always works – that way you can't go wrong!